Thursday’s formal opening of my show ‘Secret Gardens of St John’s Wood‘ went well, decently full without being too crowded, and I had the time to talk to most of the people who came, though as usual forgot to say some things I had meant to. And people seemed genuinely to like the work, with quite a few buying copies of the book – currently only available from the Queen’s Terrace Café where the show continues Mondays to Saturdays until the easily remembered date of 5th November. Dr Cathy Ross from the Museum of London gave a short opening address, linking my work to a project the museum had carried out some 20 years ago, and stressing the importance of documentary work such as this which created a record of what otherwise would be a largely unknown aspect of social history. It was good also to meet again (or in some cases for the first time) some of the garden owners and hear their views, mostly very complimentary, of my pictures. One image that attracted quite a bit of attention was the only non-rectangular image in the show, and one that came about rather by chance. Before I took each image for the project I carefully chose a particular viewpoint and thought about how to make a picture in terms of the horizontal and vertical limits of a virtual rectangular ‘frame’ I was going to fill*, and this image was no different. Almost the entire project involved a different way of working to my normal photography and there is not a single image in the show (though a few in the book) that I could actually see in a viewfinder when I took the image. Most are put together from between 3 and more than a dozen separate exposures to produce the picture I had in mind before taking them. This shows the view, invisible from the street, that hits you immediately when you gain admission via the entry-phone to the high-walled garden, and was taken with my back literally against the door. It was a busy afternoon at the house, and I had to work quickly in case someone came to the entrance, when I would have had to interrupt taking the picture and move my tripod out of the way. I always started taking pictures where I intended one edge of the picture to be (normally the left), placing that in the centre of the first frame and tried to end it with where the far edge in the centre of the last frame. To join the images, the software first alters their shape to suit the projection being used, changing the rectangular images into ones with curved edges. When the frames are combined to give the overall image, this results in an irregular shape with wavy edges, which are then normally trimmed off to give you a rectangle. One of the reasons for using a lot of overlap when shooting the series is that this makes the ‘waves’ shorter and thus less deep, and you have to trim less. This strip of garden between the gate and front door was actually fairly narrow, and I decided that a single row of images would not give sufficient vertical coverage to include the chimney of the house. I need to use either two rows in portrait format or three rows in landscape format, and chose the second. In the end it didn’t quite happen like this, and, thanks to the dog I ended up with a rather better picture, if one that some people are confused by. They interpret the picture with its dark grey background as being taken through some kind of gap in a fence, which although not literally the case, is certainly a good metaphor for what like the other images in the show is certainly a peep into the private domain. As I was making the picture, one of the house residents, a large black dog, was running around the garden and watching me. I thought about cloning him in several images but decided more than one dog would be an unwanted distraction, and tried to avoid him. Finally, just as I was finishing the exposures I needed he came up and posed just in front of me and I took another exposure with him in the middle. It was an image that didn’t fit the rectangle, which would have cut the dog in half, but rather than use a different exposure of the centre area of the path I could see two good reasons to include the image with the dog. The dog was beautifully positioned in a fine pose, tail leading up to the doorway of the house, and secondly the extra area of path in the centre of the image gave a much stronger impression of the path leading to the house. It would have been difficult to include it in a rectangular image as the tripod legs would have appeared. I took out a few of the 18 or so images I’d taken from the image to produce a slightly more attractive overall shape which you see, placing the image on a dark grey background – the same tone as used for the introductory page for each garden featured in the book. But this is a picture which, if not taken by a dog, was certainly made by one. 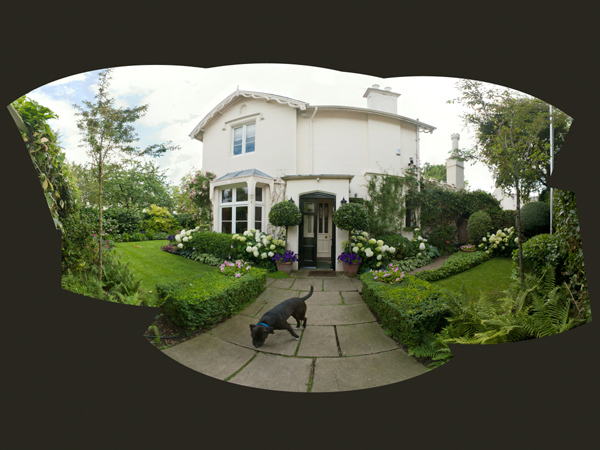 Few of these panoramas stitch perfectly automatically, and most need a little assistance with appropriate masking of some of the images. Plants are not entirely static, especially on windy days, and anything very close to the camera is likely to be a problem, as it is hard to get absolutely precise positioning. Joins between images often need to be moved to areas where any slight misalignment is not noticeable, for example empty areas of wall rather than window frames. All of the images shot RAW and were pre-processed in Lightroom before being combined in PTGui. Basic exposure, fill light, black point, brightness and contrast were simply synchronised across a set of images, but considerable care was needed to apply the ‘adjustment brush’ in the same way to matching areas on different frames. * The projection used in assembling the images alters there appearance in a way that is hard to predict when taking the series of frames. Mostly I made use of an equi-rectangular projection which I think is a more general version of the cylindrical projection of my earlier film-based panoramas, but for some I found the newly rediscovered vedutismo projection worked better. This entry was posted on Saturday, September 24th, 2011 at 09:11 am and is filed under My Own Work, Technical. You can follow any responses to this entry through the RSS 2.0 feed. You can leave a response, or trackback from your own site.